Motorola has released the Android 8.0 Oreo update for the Moto Z2 Play which the company confirmed last year in the list of devices to get this update. The company finally rolled out a stable Android 8.0 oreo update for the smartphone. 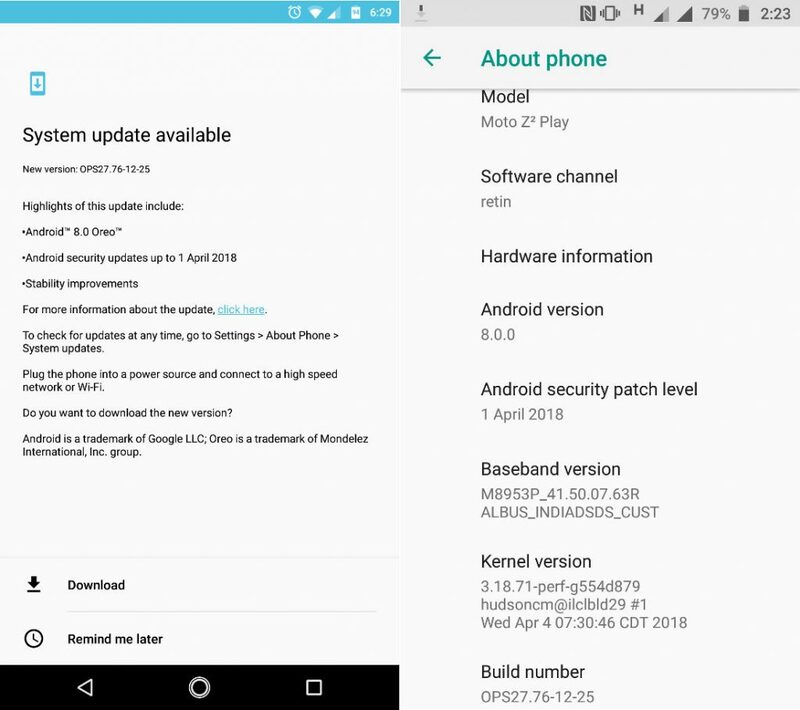 The company recently released the update to the Moto Z Play last month and now the update has started rolling out for the successor. Lenovo owned Motorola brought this update to the Moto Z2 Play last month in Europe. The new update brings lots of new features to the smartphone including the new Android security update up to April 2018. Motorola has released the changelog with this update which includes all the changes and improvements. The update, of course, comes with Android 8.0 Oreo features including background app limits, notification channels, snooze notifications, Autofill API, Picture in Picture mode, adaptive icons, companion device pairing, keyboard navigation and many more features. You can read about more Android 8.0 Oreo features here. Apart from the Android 8.0 Oreo features, Motorola has added some stability improvements and bug fixes. The build number for the Android 8.0 Oreo update is OPS27.76-12-25 and the update is about 1.2GB in size and it includes the latest security update. Lenovo is also providing the Android 8.0 Oreo update to its Lenovo K8 Note which comes with the Vibe UI from the company. To get these updates on your smartphones, go to Settings > About phone > Check for updates.